Hubby and I enjoy hiking around the reservoir near our house. For this post I was inspired by Rainfield's blog My Journey. Rainfield's macro shots are awesome and I love his nature photos and hikes. 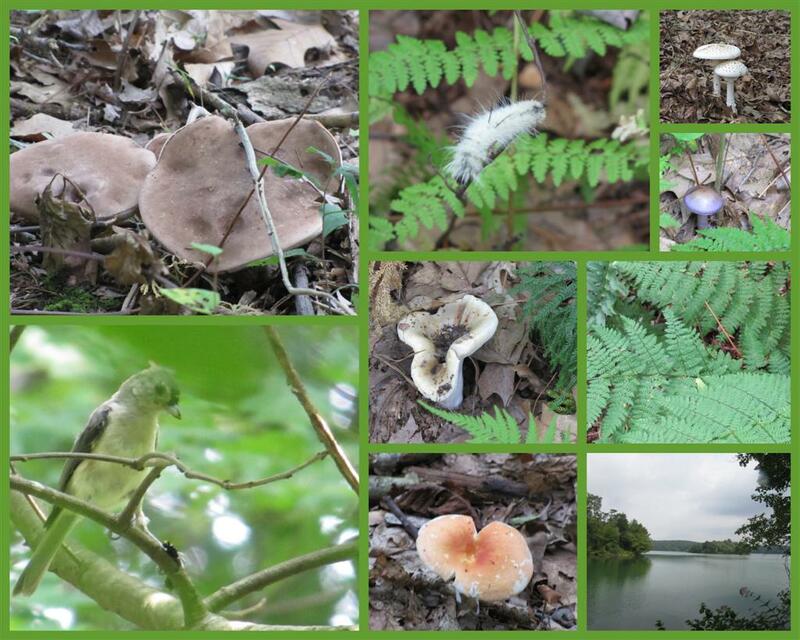 So during my walk I checked out all the mushrooms and I was looking for all kinds of bugs, birds and critters. My photos below are the nature scenes I saw while on my hike. I found some colorful mushrooms along the trail, I am sure they all have names but I would need some help on their id's. Some mushrooms were orange in color and some were purple. The birds were peeping out at me while we hiked. Below, this mushroom reminds me of a minature birdbath. Maybe a little critterbath. Maybe it is a bath for this tiny dragonfly. I am not sure if these fuzzy critters take baths. This Tufted Titmouse wanted to take it's bath in private. We ended our walk at a spot near the lake, where we had a view of a small island in the middle. This was the first time hiking in this spot and the views were all new for us. Not a bad spot considering it is only a short drive from our home. I hope you enjoyed my scenic nature hike. And to see more beautiful scenes please visit Scenic Sunday. Thanks to the Holley's for hosting Scenic Sunday and thank you for visiting my blog. Have a safe and wonderful Labor Day weekend. Hi, thanks for becoming the latest follower on News from Italy and for commenting already on my Bolsena post. I am going to follow you here and on flickr, as well as your travel blog, as I have enjoyed what I have seen so far. So many mushrooms where you are already, a sign of Autumn. What a beautiful hike that must have been and what a sight at the end! I have to say that I am fascinated by mushrooms and I am especially intrigued by that purple one . . .
You saw quite a variety of fungi....I've never seen one like the blue one. And the views of the lake and island-nice! 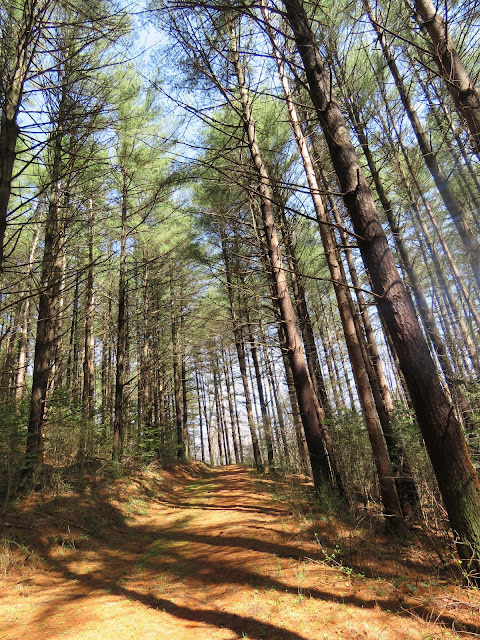 You've found a nice place to take a hike. I like the composition of all your pics, really nice! Looks like it was a great walk! How nice to have a reservoir nearby. What a beautiful place Eileen and I loved to look at all the mushrooms. Great photoshots. Have a nice week. A wonderful post I really enjoyed the collages. Thanks, Eileen, for taking me along on your hike... Your eye spied so many of nature's riches and your captures are terrific. I've never seen a purple mushroom. Nice to live so close to good hiking grounds. Beautiful photos, that looks like a great hike. That looked like a great hike. Nice pics. I enjoyed myself for sure! 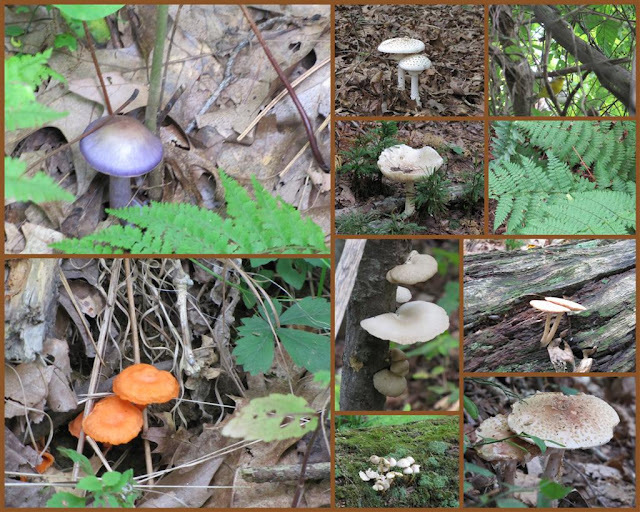 What a great collection of mushroom shots! I'll have to wait a couple of months before I find any here. Lovely photos, I especially like all the shrooms! The one with the dragonfly on it is wonderful. This post was a great reminder to me to sometimes look DOWN -- there's a whole world at our feet! Oh Eileen, your mosaics are GORGEOUS! I love them and hope to see more!